Chinese hot pot is something that hubby and I indulge in almost every winter. We go the all-you-can-eat route, and we're usually overly stuffed by the end of each marathon meal. Last year, we skipped our cold weather hot pot visits, because neither of us felt like overindulging at a buffet. My in-laws and some of our friends do Chinese hot pot at home, but I've never been too curious about trying it myself. That is, until a close friend of mine tried it recently. She told me about buying the flavoured broth mixes from T&T and how delicious the result was, but my interest wasn't piqued until she said the magical word. Some of you know that I am a big fan of all things spicy, but Sichuan peppers hold a special place in my heart. I love how they numb my mouth in a delightfully cooling way, and the flavour is unlike any other spice I've tried. I order Sichuan broth at hot pot whenever I can, and I don't really lovelovelove hot pot unless I get my fill of this mouth-numbing spice. In fact, I was just telling hubby that when I'm craving hot pot, it's really the Sichuan broth I desire. It's a little odd because I have Sichuan peppers in my spice drawer, yet I rarely use them. It never occurred to me to make my own Sichuan broth or that I could buy pre-made seasoning. Over the holidays, hubby and I made a trip to T&T and purchased a couple of hot pot seasoning packets. 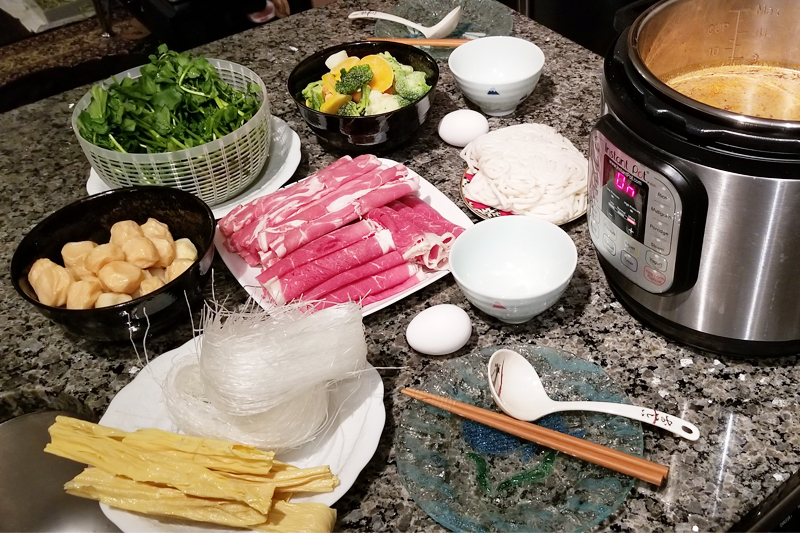 We used them tonight to make Instant Pot Chinese Hot Pot, and it was just as delicious as my friend claimed. Pictured above is half of our food, which I portioned out for us to eat today. Hubby and I didn't think it would be enough, because we usually eat AYCE, but amazingly, it was. We were both bursting by the end of the highly satisfying meal, and we're excited to chow down again tomorrow.